Still working on my NaNoWriMo novel, though I hope to finish well before the end of the month. In the meantime, I’m trying to catch up on a few long-delayed posts! Last month, I had the pleasure of reading and reviewing Haunted Legends, a horror compilation edited by Datlow and Mamatas. There were quite a few outstanding stories in the compilation, but one that really, really impressed me was The Redfield Girls, by Laird Barron. I wasn’t disappointed — Barron’s horror fiction is wonderfully written, subtle, and remarkably horrific! The Imago Sequence collects nine of Barron’s short stories, published (with one previously unpublished exception) between 2001 and 2006. That may seem like a relatively small number of stories for a collection, but Barron’s tales are lengthier than the typical horror story; some are pushing into novella length. This is actually quite refreshing, as the longer tales allow Barron time to build up a sense of dread and develop his characters, and in my opinion there aren’t any wasted pages. The writing itself is quite beautiful, even poetic in certain places. Procession of the Black Sloth. A man investigating industrial espionage in Hong Kong gets drawn deeper and deeper not only into his assignment but also into an ancient and hellish world. Bulldozer. A veteran Pinkerton detective pursuing a stolen book of demonology finds that the thief has connections that run deep, and tastes that threaten to upset the roles of predator and prey. Proboscis. A washed-up actor takes a new role accompanying bounty hunters for a reality show. Something is pursuing them as well, however, and it has a particularly horrific way of feeding. Hallucigenia. In the wake of a horrible tragedy that has crippled his young wife, an aging millionaire investigates the unusual circumstances behind the event. He begins to learn that he is but one victim in a growing danger that threatens to consume all. It is difficult to really explain why Barron’s stories are wonderful. Like the stories of most of my favorite authors, the joy of them is in the telling of the tale, not as much where they end up. Two things really stand out in the stories, however: the subtlety of the horror and the colorfulness of the characters. The latter point is worth mentioning in a bit more detail. The tales of The Imago Sequence all center on male characters who are all past their prime in some way: a jaded detective, an aging spy, a failed actor, an older man with a young wife he can’t handle. Issues of masculinity and emasculation are recurring themes in this collection. One other observation regarding the characters: they don’t act like idiots! It is nice to see characters who act very sensibly and smart — and still end up suffering horrible fates! 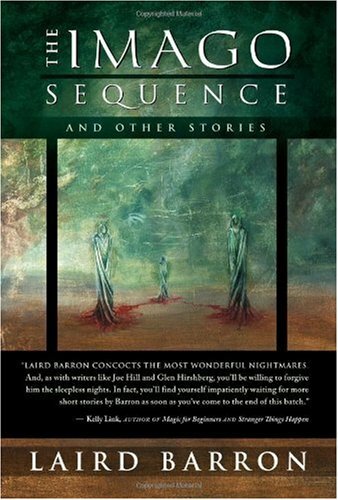 Barron’s The Imago Sequence is a wonderful collection of stories that I can highly recommend. I’ve already ordered his more recent collection, Occultation, and really looking forward to reading it!